What Is Your Strategy To Restore Windows XP Backup to Windows 7? Microsoft has made sure that IT architects use myriad of techniques to stay upgraded with features and stay ahead from competitors and hence provide best solutions for creating backup. Let it be Windows XP or 7, it has always provided better facilities for creating backup with “NTBackup” and “Backup and Restore” applications respectively. But the question which matters is, “Can you restore Windows XP backup to Windows 7 ?” The answer is sadly “No”. BKF file created by you in XP is not supported by the following Win7 version and hence data recovery from Windows backup file is not possible. Our software on the other hand lets you take benefits of data recovery without needing NTBackup application and hence is a reliable solution for your need. Microsoft used NTBackup solution for XP which created a file with an extension of .bkf and comprised of each and every type of data files like images, documents, email storage files, MS Office files, etc. This backup file is restorable only by same application. 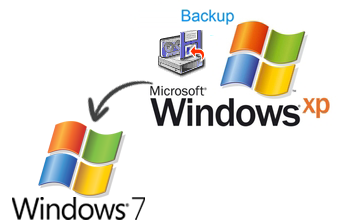 Windows 7 on the other hand is not acquired of this application and uses system image backup and its architecture is completely different and hence do not support or recognize backup file. Although both backup applications are efficient but the link or provision to restore/open Windows BKF to Windows 7 is absent. Our tool on the other hand diminishes this lag and provides a complete recovery of data files from BKF file. It is blended with many competent features and thus lets you exhibit an error-free recovery of files smoothly. How Is This Software Capable To Restore Backup File? Windows Backup Recovery software is having a mechanism using which it can scan the data files of the backup file without any need of NTBackup application and provide you a detailed preview of all the files inside BKF file. You can also select desired files amongst these files and only those files will get extracted that too at desired location. Multilevel scanning make the product more beneficial to restore Windows XP backup to Windows 7 and the software also works well for damaged file. All these plus points come in a single package which can be easily availed by you by downloading it from provided link.